From that same hotel window, through the glass. See how light it looks, it appears to float. Not many buildings can do that. Especially high-rises. And see it touch the ground lightly. With the proper lighting, it’d be perfectly ethereal, like his Seagram in New York. From a Vincent Scully video you’ll love. 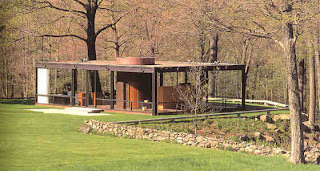 Johnson’s Glass House in New Canaan, Connecticut. It’s on 47+ acres and will open to the public this April. 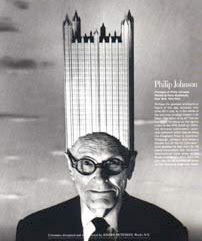 Scully quotes an article by Johnson in the Architectural Review. About 57:00 minutes into Scully’s lecture – he’s got a picture of Mies’ Seagram Building up on the left, he’s trying to explain it, and the slide projector on the right goes out. No Powerpoint for Vincent Scully. It’s very funny. Scully gets very impatient. And then, an image comes on the right… but the slide is in wrong. Yes its Mies’ Seagram Building, but it’s on its side. An impossible moment for the rather upright Vincent Scully. You are currently browsing the archives for the Seagram category.